March 12 (Bloomberg) -- New York developer Robert Moses favored cars over people in the 1960s, when he tore down the art- filled plaza that greeted pedestrians approaching the Brooklyn entrance of the Manhattan Bridge. These days, it’s not worth the risk to life and limb to linger at this bleak, congested approach to the span that crosses the East River, linking two great boroughs. Just in time for the bridge’s 100th birthday, artist Brian Tolle is busy rectifying this unhappy situation. In 2007, Tolle won a Design Award from New York City and with it the commission to create a permanent installation at the bridge -- a work that should help reclaim the area for human beings. Tolle is constructing near-replicas of a pair of sculptures by Daniel Chester French. The allegorical figures representing Manhattan and Brooklyn in female form sat at the bridge’s entrance from 1916 until 1963. Manhattan sits upon a chest, holding a winged globe -- a symbol of power -- with a peacock at her side. Her bearing is more regal than that of Brooklyn, who wears a laurel wreath and sits next to a boy reading, a church and a lyre. The sculptures were moved to the Brooklyn Museum’s entrance to accommodate more automobiles and the revamping of the bridge plaza. Moses rarely had pedestrians in mind when he remade New York. He was a tireless champion of the automobile, although he himself never drove. Moses deserves credit for much of New York’s urban development in the 20th century, as well as much of the blame for snuffing out neighborhoods with roadways. 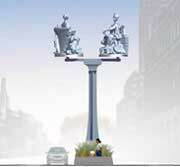 Tolle’s replicas will preside over one end of Flatbush Avenue, which is itself poised for a broader, $23 million makeover. The city plans to break ground in late spring on a project to beautify the three-quarters of a mile between the bridge entrance and Lafayette Street. The Flatbush Avenue Streetscape project aims to green up the chaotic, car-centric thoroughfare that leads to the bridge. The city plans to repair and broaden the sidewalks and build a median strip for pedestrians -- with shade trees, park benches and better lighting. Tolle is known for his more somber, contemplative “Irish Hunger Memorial” in Battery Park City, Manhattan, a half-acre landscaped construction using soil, plants and rocks from every county in Ireland. While that work remembers a solemn past, his bridge project will illuminate the present symbiosis between the boroughs. “It will function symbolically as kind of a beacon entrance. The moment you step on Brooklyn soil, you’ll be greeted by this,” Tolle says, pointing to a computer animation of his piece. His renditions approximate the size of the originals -- 11 1/2 feet tall. Since his pieces will be closer together than French’s had been, he may decide to shrink them down to about 10 feet, in order to maintain the originals’ relative proportions. Two aspects of the work are striking. Tolle is sculpting his pieces out of polyester resin, a translucent material to be lit from within to create an icy blue illumination. (The originals are gray granite). Also notable, these statues are in motion. Linked by a platform which sits on a 24-foot tower of steel, the pieces revolve around each other, their movement symbolic of the dynamic relationship between the two boroughs. The steel tower will be painted in the same powdery blue as the real bridge and will taper at the foot to suggest the actual structure’s form. Tolle hopes to have his installation completed in time for the Manhattan Bridge centennial celebrations in July. The overall beautification project will likely take two years to complete. Not only room for art, but for people -- pedestrians, bicyclists, and anyone who wants a moment on a park bench. Hopefully, we’ll continue to see this shift in priorities intensify as infrastructures designed for automobiles are replaced or retrofitted with more human touches. Tolle’s “Levittown,” a playful homage to the nation’s first mass-produced suburb, is on view through March 21 at the CRG Gallery on West 22nd Street in Manhattan. For more information: http://www.crggallery.com.